Are you an adult who needs braces? Do you assume that your orthodontic issues are purely a cosmetic concern? Not so fast. If you are avoiding orthodontic treatment as an adult, you may also be neglecting your oral health. Crooked teeth and malocclusion pose serious threats to the health of your teeth and gums over time. Sure, a pretty smile is a major reward of undergoing orthodontic correction, but you could also be saving yourself from costly dental problems down the road. Did you know that you can reduce your risk of periodontal disease by caring for your crooked teeth? Malocclusion refers to teeth that are not aligned properly in your mouth. Left untreated, malocclusion can lead to periodontal disease, which can create abnormal amounts of stress on your teeth and jaw. This condition leads to premature wear. Crowding: When teeth are too closely aligned, or overlapping, there’s an increased chance for bacteria and plaque buildup. This can lead to decay, gum disease and eventual tooth loss. Gaps/Spacing: How can a gap between your teeth be a cause for concern towards your smile health? You may have frequent episodes of food getting lodged between your teeth. This puts you at risk for sore or tender gums and other periodontal issues. In certain places, teeth gaps can also impact your ability to chew and speak. Deep Bite: Over-erupted or protruding lower front teeth can damage the palate as well as cause the premature wear and chipping of those lower teeth. Crossbite, Open Bite and Overjet– Again, when the teeth don’t bite down on each other the way they should, it can result in the fracture of teeth due to the excessive forces. In addition, abfraction can develop, which is a small notch in your tooth at the gum line. Periodontal disease, gum recession as well as tooth and bone loss can also become a concern in severe cases. As proven above, straight teeth are not just attractive teeth. When the teeth are correctly aligned in the mouth, it supports your overall oral health. Untreated malocclusion makes it difficult to keep your teeth clean and can put pressures on your teeth and jaw that they are not intended to withstand. From TMJ problems to serious gum disease, there are notable factors to consider if you’ve been told you need orthodontics as an adult. Don’t worry; Pure Dental Health offers some of the most advanced and preferred orthodontic treatments available, including Invisalign, Six Month Smiles and Adult Braces. Call now to schedule your consultation in Buckhead or Dunwoody! Every smile is important. Many people in their adult years are unhappy with their smiles, yet they mistakenly believe that they are past the point of no return. They assume that if they did not have their smile corrected in their adolescent or teen years that they are too old for orthodontic treatment. The fact is, a healthy mouth can be corrected and improved at any age. There are many great options for achieving a red-carpet smile these days. Orthodontics have come a long way since they were introduced to patients more than 2,000 years ago. For years in America, orthodontic patients only had the option of wearing metal braces for two to four years in order to correct their smile. While this was often seen as a “rite of passage” for adolescents and teens, it was rarely appreciated by adults who were not able to undergo orthodontic treatment at a young age. Traditional metal braces are still not an ideal option for many because of professional reasons, athletic involvement, or convenience. That is what makes Invisalign® clear aligners such a great option for those who want to achieve a red-carpet smile but who do not want to use traditional metal brackets and wire braces. Invisalign® is a specific orthodontic treatment that uses a series of aligners to move the teeth into their desired positions. These aligners provide a more comfortable and convenient method of orthodontics because they are removable while eating and cleaning the teeth, and they do not require the discomfort of tightening metal wires inside the mouth. To ensure that you are getting the most out of your Invisalign® treatment, the following tips will help you straighten your teeth as quickly and successfully as possible. Floss your teeth every single day. While brushing your teeth may be a habit that you rarely have to think about doing, flossing is often an overlooked dental habit. Floss helps to remove bacteria-laden plaque from the gum line and between the teeth. Because Invisalign® aligners fit snuggly against your teeth, any grime that is stuck between the teeth and/or at the gum line will be trapped. Flossing your teeth every single day will help to keep your teeth and gums clean and healthy. Wear your aligners at least 22 hours every day. In order for your Invisalign® aligners to do their job efficiently and successfully, they must be worn at least 22 hours a day. This means that unless your aligners are removed because you are eating or cleaning your teeth and aligners, they should be in your mouth. The aligners cannot and will not work if they are not inside your mouth! Stick to your prescribed schedule. Every patient is given a schedule to follow for wearing their Invisalign® aligners. Because the aligners work in a series, gradually changing each time you put new aligners inside your mouth, it is important to stick to the schedule. Most patients switch out their aligners for new ones every two weeks. Some patients have a different schedule due to specific concerns. It is important that you adhere to the schedule in order to see your desired results. If your dentist tells you to wear your new set of aligners an extra week, there is good reason and you should do it. If you are supposed to change aligners every two weeks, then set a reminder to remind you to change your aligners. You will not achieve the red-carpet results that you desire if you do not stick to the prescribed schedule for changing your smile. It is also important to note that you will not make your treatment go faster by skipping ahead to new aligners before you are supposed to. In fact, this can actually make your treatment slow down because missing a step can mess up your progress. Do not give up on your aligners. At first, your aligners will feel strange and foreign inside your mouth. This is normal. You may speak with a lisp for a few days, your mouth may be a little sore, or your aligners may just aggravate you – but do not give up! The more you wear your aligners, they more natural they will feel inside your mouth. Clean your aligners daily. It is not advised to brush your aligners with toothpaste as this can scratch the plastic, but it is important to clean them each day. Putting dirty aligners into your mouth will only cause your teeth to be dirty and your gums to become infected. The best way to clean Invisalign® aligners is with warm water and antibacterial soap. Commit to wearing your retainer. Once your Invisalign® treatment is complete and you have achieved the red-carpet smile you dreamed about, it is up to you to maintain it. Most patients will receive a retainer to wear for a few months. This retainer is what holds your teeth in their new position. Do not ruin your brand-new smile by choosing not to wear your retainer. At Pure Dental Health, we are proud to offer Invisalign® orthodontic treatment to patients who wish to improve the appearance of their smiles. Please contact our practice to schedule a consultation appointment to learn whether you are a good candidate for Invisalign® or whether another option is more suited for your needs. We look forward to helping you achieve that red-carpet smile you have been dreaming of! For decades, the only way for people to achieve straighter teeth was through the traditional orthodontic treatment that utilized metal braces. While highly effective, they are often an undesirable approach for adjusting a person’s teeth simply because of how noticeable and unattractive they are. Adults are typically the most self-conscience about undergoing orthodontic treatment; whether they fear embarrassment in professional settings or in their social lives, adults often choose to live with crooked teeth rather than choosing orthodontic treatment. This is where the advantages of Invisalign clear aligners become so desirable for those who are looking into other orthodontic treatments. Invisalign clear aligners are an innovative approach to straightening the teeth, and they are a great alternative for many people who do not wish to suffer through metal braces for the next two or more years. The Invisalign system was designed to give discretion to adults who desired orthodontic results without having to wear traditional metal braces. Invisalign aligners work by using a customized set of dental aligners that gradually move the teeth into their desired positions. After your visit to the dentist to determine that you are a good candidate for Invisalign, you will be given a few sets of aligners that are worn for approximately two weeks. After two weeks (or a specific time determined by your dentist), you will change your aligners to the next set in progression to carefully adjust your teeth. Each time a new aligner tray is custom fitted to your mouth, slight adjustments are being made to shift and straighten your smile. This slight shifting takes the place of tightening adjustments that are typically made with traditional metal braces. The aligners work to move the teeth into their desired positions. Aligner trays are made from BPA-free plastic, making them safe for everyday wear. The transparency of the aligners makes them virtually invisible to others, allowing you to keep your orthodontic treatment as discreet as you wish it to be. Because the dental aligners are custom fitted to your specific mouth, they are quite comfortable to wear. You need not worry about irritating wires and brackets that can cause sores on the mouth because the aligners simply sit on top of your natural teeth. Patients of Invisalign Orthodontic treatment are able to go about their daily lives without any interruption or inconvenience. Invisalign aligners can be worn during recreational activities and sports without worry of injuring the mouth during participation. Invisalign is a truly convenient method for straightening the teeth and achieving a beautiful smile. The aligners are worn each day for at least 22 hours per day, and they do the work. The only times that the aligners should be removed is when you eat, drink anything other than water, floss, and brush your teeth. Their discretion allows them to go unnoticed, and if you are discreet while removing your aligners, no one will suspect that you are even wearing them. At Pure Dental Health, we want all of our patients to have the ability to achieve a beautiful, healthy smile. Invisalign orthodontic treatment is often less expensive than traditional orthodontics simply because it is often a faster method for aligning the teeth. The average case for Invisalign treatment is 12 months. However, the timing of any one person’s treatment is always based upon the conditions of a patient’s teeth and how long it will take to achieve each individual’s results. Our doctor will map out a specific aligner interval sequence based on each person’s teeth in order to create a specific time frame for successful treatment. If you would like to learn more about Invisalign and whether or not it is an appropriate treatment for your smile, please contact Pure Dental Health today. We proudly accept many popular dental plans and offer financing for those needing payment options for any treatments not covered by insurance. We want to help you achieve the smile that you have always wanted. Your smile is one of the first things that people notice and remember about you. If your smile is not leaving the impression that you want it to, you may be a good candidate for Six Month Smiles. A modern approach to traditional orthodontic treatment, Six Month Smiles uses the tried and true technology of orthodontics combined with a cosmetic approach to fit your lifestyle. Many orthodontic candidates above the age of 16 can find success with Six Month Smiles. This orthodontic technology is designed specifically for those with crooked or spaced teeth but who do not need to have a major alteration to their bite. Six Month Smiles provides shorter overall treatment time, making the entire process of having your teeth put in proper alignment more comfortable, convenient, and less expensive than traditional braces. At Pure Dental Health, we are proud to offer this orthodontic treatment to teens and adults. Many adults feel that they are too old for braces. They have a difficult time seeing past the “metal hardware” of traditional braces, and they are convinced that they must simply go through life with a smile that they are unhappy with. However, Six Month Smiles offers a visually appealing approach to orthodontics. In fact, the brackets that are used with Six Month Smiles are virtually invisible so that people will barely notice that you are even wearing them! Six Month Smiles uses Lucid-Lok® clear brackets and Chameleon® tooth-colored wires while your teeth are being straightened as a part of their revolutionary technology. This “invisible treatment” alone is enough to make many people jump at the chance to gain straighter teeth. Another added benefit of Six Month Smiles is that the average treatment time is only six months! Adults and older teens often do not have two to four years to devote to their orthodontic treatment. College, work, travel, and life are too busy to worry about orthodontics for years. Six Month Smiles provides the convenience that you are looking for to work with your busy life, not against it. Brackets and adjustable wires have been used for decades to straighten people’s teeth into their desired positions. This is the most effective method for moving the teeth effectively and safely, while also encouraging the teeth to stay in their new positions. With the use of low force, your smile can be transformed into one that you are proud to show off confidently. Six Month Smiles focuses on the placement of the teeth that are visible when you smile. This reduces the amount of force that is used during orthodontic treatment, and this low force actually means that teeth seldom need to be extracted before or during treatment. This is a huge benefit from traditional braces, which often require a more invasive approach to straightening the teeth and moving them around inside the mouth. Even during your treatment process, you will not feel the need to hide your smile. Traditional metal brackets and wires can have a negative social impact on wearers. Metal against the natural color of your teeth is hard to hide, meaning that you may feel embarrassed or self-conscious in both your professional and personal lives. Yet, with the cosmetic approach used with Six Month Smiles, you will enjoy the “invisibility” of your braces as they move into their beautiful positions. As with all orthodontic treatments, you will be required to wear a retainer once your braces are removed in order to maintain the straighter position of your teeth. There are different options available for retainers, the two most popular being a removable retainer or a bonded retainer that is placed on the back surface of the teeth. Retainers hold the teeth in their new places so that they will not shift back into their old positions. Retainers are essential after your orthodontic treatment has been completed. Many people find that they will require another round of orthodontics when they do not wear their retainers regularly – a huge disappointment after the investment of their time and money. At Pure Dental Health, Dr. Justin Scott offers an outstanding option for adults in Atlanta who desire to have a straighter, more beautiful smile. Six Month Smiles is a cosmetic dentistry procedure that offers an aesthetically straightened look and straighter smile for most patients in just six months. If you are tired of hiding your smile, if the appearance of your smile keeps you from participating in conversations or promotions, or if your smile is something that you are embarrassed by – it is time to make the decision to correct it. Contact Pure Dental Health in Atlanta today to schedule a consultation. Dr. Scott will walk you through the expectations of Six Month Smiles orthodontic treatment and whether or not this is the best option for achieving the smile you have been dreaming about. Call us today! Gum Contouring? What is It? Do you dread smiling for the camera due to excess gum tissue that shows when you smile? Are you self-conscious of your “gummy” smile? If so, read on to find out about gum contouring. Gum contouring is a cosmetic dental procedure that can be used to improve the appearance of “gummy” smiles. If your teeth look short and stubby because your gum tissue extends over your enamel, you may be a a good candidate for gum contouring. During this procedure, a dentist or periodontist uses either a laser or some type of cutting tool to remove excess tissue, thereby exposing more of the teeth. This procedure can be completed in just one office visit using a local anesthetic. The recovery time after gum contouring is typically quite short. In some cases, bone must be removed in addition to excess tissue. This procedure is more extensive and may necessitate more extensive anesthesia. This procedure also requires a longer healing period. The results of gum contouring are immediate and can be dramatic in many cases. Sometimes, this procedure is combined with other cosmetic dental procedures such as teeth whitening, orthodontics, bonding and shaping. With today’s advances in cosmetic dentistry, it is possible for virtually everyone to achieve a beautiful, balanced smile. If you dislike the appearance of your smile due to excess gums, maybe it is time to schedule a consultation with a qualified cosmetic dentist. After a thorough evaluation, an experienced cosmetic dentist can recommend the treatment or combination of treatments that are best suited to help you achieve your goals while staying within your budget. With the 2015 almost upon us, many individuals are making lists of resolutions that will hopefully change their lives, for the better. Some of you may want to lose weight. Others may want to start eating healthier. Many people resolve to save more money in the new year. And then there is the all-important goal of quitting smoking. These are all great goals, however, many of them take time. However, there is one thing you can do that will change your life in just six months. Sound too good to be true? Read on to find out how you can change your life in just six months with Six Month Smiles®. Six Month Smiles® is a revolutionary orthodontic system that enables you to get a straighter, more balanced and beautiful smile in an average treatment time of just six months. And, with this advanced orthodontic treatment, you will not have to put up with a mouth full of metal in the process. This is a game changer for many adults who missed out on the opportunity to get braces as a child. For many people, traditional metal braces are just not a good solution. The hassle and embarrassment of wearing metal braces deters many adults from straightening their teeth. And, the treatment time required for traditional braces (usually one to two years) makes it just too cumbersome for many adults. Fortunately, Six Month Smiles® offers a common sense solution to both of these problems. Six Month Smiles® works by focusing primarily on the teeth that show when you smile. This short-term orthodontic system utilizes specialized clear braces to gently straighten and align the teeth in the front of your mouth, in an average of just six months. Patients who desire straighter teeth and a more balanced smile but are not in need of major bite changes are usually good candidates for Six Month Smiles®. To find out for sure whether or not you are a candidate for Six Month Smiles®, contact a certified Six Month Smiles® dentist in your local area. You do not have to spend another year being unhappy with your smile due to crooked, unevenly spaced or gapped teeth. Instead, call a Six Month Smiles® dentist today so you can start the new year off right! Did you miss out on the opportunity to get braces as a child? Do you dislike the way you look in pictures due to crooked teeth, unevenly spaced teeth, a gap in your two front teeth or tooth discoloration? If so, maybe you should consider giving yourself the gift of a beautiful smile this holiday season. 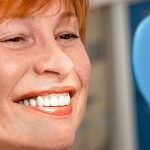 With today’s advanced cosmetic dentistry techniques and procedures, it is possible for virtually everyone to have a beautiful and balanced smile. Teeth whitening, bonding, porcelain veneers, orthodontics and dental implants are just some of the restorative and/or cosmetic dentistry procedures that can be used to improve the appearance of your smile and your overall appearance. After all, your smile is the first thing that people notice about you and can leave a lasting impression. This can effect your confidence in every social interaction you have whether it is dating, presenting at work or just sitting around the table and sharing a meal with others. You don’t have to continue to hide behind your smile. But maybe you are worried about the cost. While improving the appearance of your smile is a worthwhile investment, it can be expensive. For this reason, it is important for you to schedule a consultation with an experienced cosmetic dentist that you trust. An experienced cosmetic dentist can listen to your goals, explain the options and help you choose the treatments to help you achieve your goals while staying within your budget. It might be helpful to know that many cosmetic dental offices offer attractive financing options to help you pay for the cost of cosmetic dental services that are not covered under dental health insurance plans. You have worked hard this year! Why not make this the year that you reward yourself with a beautiful, confident smile. Do have one tooth that is a little more square than another? Do you have a rough spot on one of your teeth or a small chip in your tooth? If so, you may be a good candidate for a painless cosmetic dental procedure called enamel shaping. With enamel shaping, dentists use the same tools that are used to polish the teeth during a dental cleaning to remove a small amount of the tooth’s surface. This quick procedure can create an improved look and better feel. Typically, enamel shaping is done without an anesthetic. This may not be the case in patients with severe tooth sensitivity. Dental bonding is another painless cosmetic dental procedure that is basically the opposite of enamel shaping. With dental bonding, a small amount of composite resin material is added to the tooth to fill in holes, cracks or gaps in the teeth. Once the dental bonding material has hardened, it is polished to smooth the surface. Enamel shaping and dental bonding are relatively inexpensive cosmetic dental procedures that can be used to improve your smile. These procedures are appropriate when one or two of your teeth is in need of improvement. If you wish to improve all of or a majority of the teeth that show when you smile, porcelain veneers may be a better option. This is also the case when there is severe tooth discoloration in multiple teeth. With porcelain veneers, extremely thin shells are laminated to the front surfaces of the teeth to improve their appearance and bring balance to your smile. Porcelain veneers are a highly effective way to dramatically improve the appearance of your smile but are quite a bit more expensive than bonding or enamel shaping. If you are interested in improving the appearance of your smile but are not sure which type of cosmetic dental procedure to choose, talk to a qualified cosmetic dentist today. After a thorough consultation, your dentist can recommend the procedure or combination of procedure that best suits your goals while staying within your budget. Am I a Candidate for Clear Braces? Each year, many adults throughout the United States decide to straighten their teeth using clear braces. This is not surprising because your smile is extremely important as it affects every social interaction you have with others. Whether it is a date, a job interview, a business meeting, a presentation, or just getting together with friends and family, your smile has a big impact on your confidence level and your self-esteem. Unfortunately, your smile and your overall appearance can also significantly affect the way you are treated by others. Fortunately, advances in dental technology and orthodontics now make it possible for most adults to achieve a straighter more beautiful smile, without putting up with the time and hassle associated with traditional metal braces. If you are an adult, there are a variety of orthodontic solutions that are available to help you achieve straighter teeth without significantly altering your appearance in the process. Invisalign® invisible braces and Six Month Smiles® are two different types of orthodontic treatments that can be used to help adults improve the appearance of their smiles. The Invisalign® system utilizes a series of custom-made, clear aligners that can be worn over your teeth to gently move them into the desired position. Six Month Smiles® uses a patented set of Lucid-Lok® clear brackets and tooth colored wires as well as low forces to move your teeth into the desired position. Both of these options offer significant advantages over traditional metal braces, however, they are not suitable for every patient. Both the Invisalign® system and Six Month Smiles® can be used for most patients with crooked or misaligned teeth. However, if you are in need of major bite changes or have other dental health issues, you may not be a candidate for either of these options. Only a qualified dentist can determine for sure whether or not these orthodontic solutions are right for you. If you are interested in clear braces, the first step is to find a certified and experienced Invisalign® and/or Six Month Smiles® dentist in your local area. Then, you and your dentist can decide together which option is best suited to help you meet your goals while at the same time fitting your lifestyle and your budget. How Does Brushing Your Teeth Protect Your Heart?